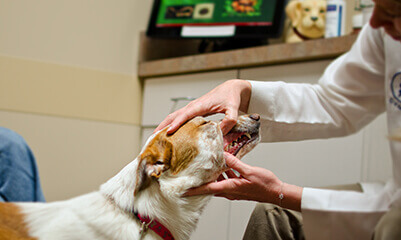 Annual Veterinary Exams: Walnut Creek’s comprehensive annual exams evaluate temperature, skin and coat health, hearing acuity, lung and chest health, internal health, oral hygiene and visual responsiveness. Because pets age much faster than humans, disease and illness progress much faster as well–making preventative care extremely important for older pets. Walnut Creek Veterinary Hospital recommends twice-yearly exams for most dogs over seven, and cats over 9, as they are prone to many age-related conditions that become increasingly difficult to diagnose and treat if not caught early. Schedule a comprehensive physical exam for your pet online or by calling (402) 261-2307.